or the Bushmens Lodge direct on +27230040077. 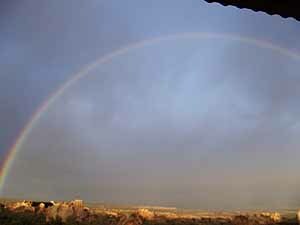 Kagga Kamma a private game reserve can be found in the Swartruggens region approximately 250 kilometres from Cape Town. 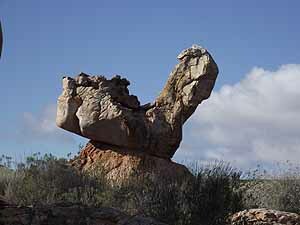 It is bordered by the Cedarberg to the northwest and in the east by the arid Ceres Karoo. 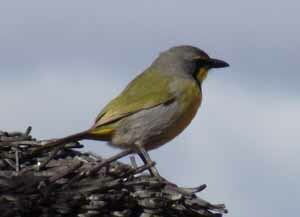 The area is covered by shrubs with names such as kakiebos, taaibos and skilpadbessie to name a few. Many of these shrubs were used by the ancient San peoples to build their huts and to make bows and arrows with which to hunt. The 15000 hectare reserve is made up of a number of farms and has a natural beauty of its own, The owners recognised this potential and decided to open the reserve to the public. However to do this they had to put in infrastructure such as roads and trails, and accommodation for visitors. Water was scarce and attempts to find it were unsuccessful due to large rock formations thirty metres below the surface which drills could not penetrate. To solve the water problem a farm to the south of Kagga Kamma was purchased and the water on this farm is utilised by the reserve. 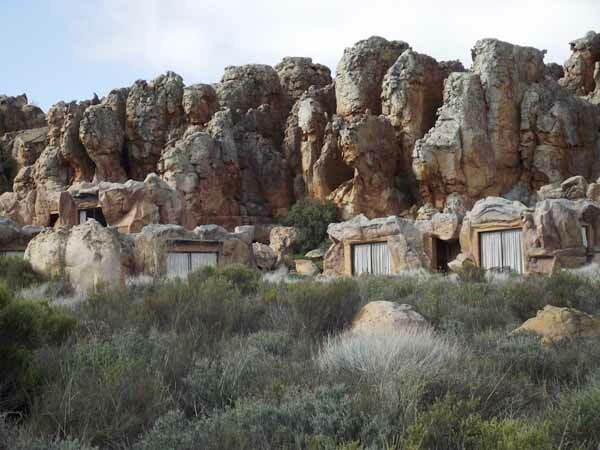 Architects had a field day designing Bushmans Lodge which was built with its rooms resembling Bushman caves and huts. The rooms are built between sandstone formations and are equipped with all the modern conveniences that are found in most modern hotels today. 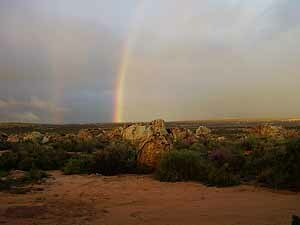 Kagga Kamma is blessed with a rich cultural heritage left behind by the Bushman and San . 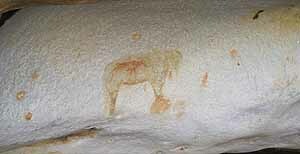 Rock paintings which are estimated to be up to 6000 years old are scattered all over the reserve on rock formations and in caves. 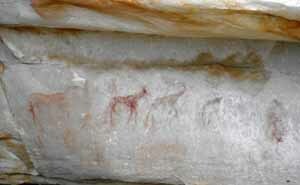 Sadly the people who decorated the rock walls with their art have been extinct for more than two centuries now. The San were hunter gatherers and followed wild animals as they moved around the countryside. When the Dutch and later the British came into contact with them conflict arose and the San were forced off their lands. The problem between the groups was so bad that farmers openly hunted and killed the San who were considered to be vermin and sub human. Today however their contribution to the heritage of South Africa can be found in many caves and rock formations all over South Africa. 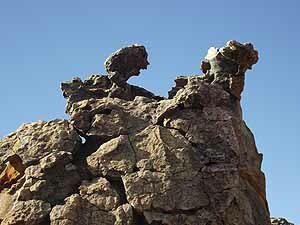 Kagga Kamma has a group of Khomeni bushmen living in the Reserve. They make a living by selling their handicrafts to visitors to the area. A while back a storm blew up over these bushmen when it was felt that the owners of the reserve were abusing them. The bushmen were required to entertain visitors with their dancing and other skills but when the show was over were expected to return to their lowly huts and continue life as normal without proper recognition for what they were doing. The reserve is home to a large variety of wild animals which include the Burchell's zebra, the eland, gemsbok, kudu, white tail gnu, blue wildebeest, and bontebok. Smaller antelope such as springbok, grey rheebok, Cape grysbok, duiker, klipspringer and steenbok are also to be found in the reserve. There are a large number of smaller animals such as the dassie (rock hyrax), yellow mongoose, rock rabbit, Cape hare and striped polecat. On the open plains many larger birds such as ostriches, secretary birds and the kori bustard are to be seen. 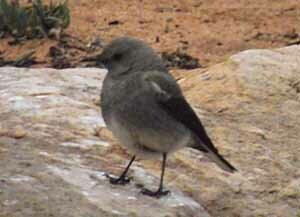 Smaller birds such as the Cape robin, Cape bulbul, Cape sparrow and house sparrow are also found in the area. Water birds such as the Egyptian goose red billed teat, black duck and South African shelduck are attracted to the area by open water during the winter months. Kagga Kamma owners have not only restocked the area with antelope, built up an excellent infrastructure but have also employed some excellent people to guide you around the reserve. Your stay will include guided walks and drives around the reserve, breakfast in the bush and night time game drives. Kagga Kamma being way out in the country away from most of the pollution found in the cities has also included a Mini Observatory as part of their attractions in the reserve. Here the visitor can view the night skies through a 10 inch telescope and see the moon and planets close up . 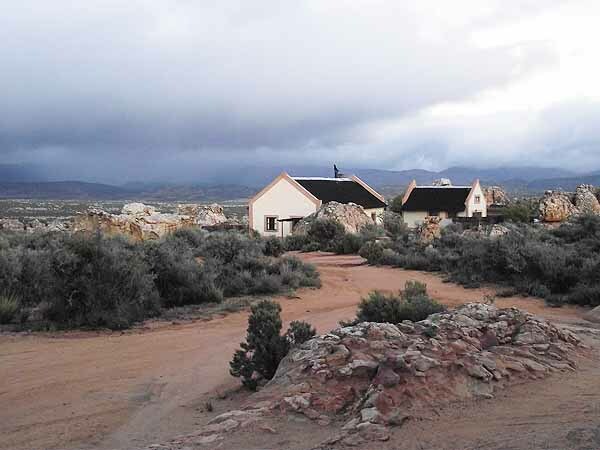 For visitors wanting luxury accommodation, a unique experience of living in a wilderness area filled with the culture of its original inhabitants, Kagga Kamma is the place to visit.